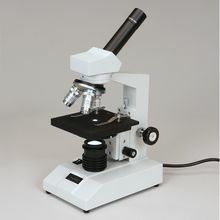 Wolfe® CFL Educational Microscopes is rated 5.0 out of 5 by 1. Grades 7-12. Get the features you need, including an inclined and rotatable head, in-base illuminator, and disc or iris diaphragm, at affordable prices. Quality DIN optics include a widefield 10× pointer eyepiece and 40× and 100× objectives that retract to prevent possible slide damage. Locked-on eyepiece and stage clips protect against loss and tampering. Five different configurations are available. Grades 7-12. Get the features you need, including an inclined and rotatable head, in-base illuminator, and disc or iris diaphragm, at affordable prices. Quality DIN** optics include a widefield 10× pointer eyepiece and 40× and 100× objectives that retract to prevent possible slide damage. Locked-on eyepiece and stage clips protect against loss and tampering. Five different configurations are available, and each comes with dust cover, foam case, and Wolfe® lifetime limited warranty (excluding bulb, cord, and fuse). Size, 14" H × 5" W × 6-1/2" D; weight, about 7 lb.